Against the background of the surge, David Finkel twists the concept of wartime good into a cosmic joke. In Washington, they read. Foreign policy decisions made by men and women in suits, understandably too busy to embark on a fact-finding mission to every war zone, disaster area or human rights debacle, often depend on the labor of reporters (who report) and experts (who filter raw eyewitness accounts into something historically and politically resonant, primed for the partisan echo chambers). In October, in the thick of the Beltway debate over the best course of action in Afghanistan, the Wall Street Journal observed that White House and Pentagon policy-makers were studying two histories that draw divergent lessons from the Vietnam War. (The article did not challenge the plausibility of the Afghanistan-Vietnam analogy itself.) One, Lessons in Disaster, by Gordon M. Goldstein, warns about the dangers of accepting military advice as gospel; the other cautions against bowing to popular dissent and discontent when a counterinsurgency fight is still winnable. According to the Journal, the latter book, A Better War, by former Army lieutenant colonel and CIA official Lewis Sorley, had already “shaped the debate over the 2007 troop surge in Iraq: Military commanders and top Pentagon civilians pushed the book ardently on surge skeptics, winning important converts.” Of the two books, A Better War was not the one positioned on President Obama’s nightstand. A study like Sorley’s, although culled from oral interviews and tape recordings of combatants, still gets written at some remove from actual combat. Those who extrapolate policy from the author’s conclusions are heading straight for its revisionist lessons without firsthand experience of the mistakes. The pain of combat is immediate, but the consequences of war can take decades to suss out–otherwise, Vietnam wouldn’t be today’s hot topic on Capitol Hill. The big question, for all the election-year calls to “support the troops” and “think of the soldiers,” is whether the cognitive (and, of course, physical) distance between the volunteer forces who fight Uncle Sam’s wars and the elected officials who declare war can ever be narrowed. Exploring that chasm is what gives the recent world-historically depressing British comedy In the Loop, which portrays the run-up to the Iraq War as a series of petty ego clashes between cynical spin doctors, its bitter kick. Nations and their leaders have no more existentially fraught responsibility than their power to declare war. And in Washington, and everywhere else that isn’t on the field of battle, we read, ideally, in hopes of discovering what war is like, though any soldier will tell you we can know nothing about what it is. Because to be sent to war is to be ordered to commit acts of justified murder. With The Good Soldiers, David Finkel aims to say nothing more about war than can be said definitively. Finkel, a Washington Post reporter who was awarded a 2006 Pulitzer Prize for a series explaining a US-funded push for democracy in Yemen, embedded himself in the 2-16 Army infantry battalion (nicknamed the Rangers) in the spring of 2007, as it prepared to enter Iraq as part of the last-ditch counterinsurgency mission known as “the surge.” The almost outlandish advance praise heaped on The Good Soldiers (Geraldine Brooks said it “may be the best book on war since the Iliad“) only serves to underscore the paucity of direct coverage of the soldiers during this war. And unadulterated views of war are ever harder to come by: the military recently tightened its regulations on photographing soldiers killed in action, and the Pentagon’s continued dependence on unmanned Predator drone attacks in Afghanistan and Pakistan means that even soldiers aren’t seeing the full contours of the global battlefield. As an embedded reporter, Finkel opts to remain invisible, unlike other journalists who have written distinguished material from inside Iraq, including Evan Wright, the author of Generation Kill (whose Marines open up to him when they discover he used to write for Hustler) and Dexter Filkins, author of The Forever War. Eschewing moral judgment, policy proposals and military techno-babble, Finkel writes concisely and vividly about trauma and regret, leaving us defenseless against the steadily accruing collateral damage of combat. This is not a new story. Still, to borrow the first sentence of the Ford Madox Ford novel whose title Finkel’s reprises, this is the saddest story I have ever heard. Amid the protracted debate about troop deployments in Afghanistan that has considered seemingly every voice but that of the soldiers, The Good Soldiers offers a searing reminder of the human cost of escalation. The book’s title, innocuous at first glance, is a provocation. With its echoes of the twentieth century’s “Great War”–Ford’s novel, published in 1915, is set on the eve of World War I–The Good Soldiers acknowledges the irony of a search for heroism in a conflict that conscientious observers had already written off as a mistake, and one that could no longer even hold the attention of the American public. It’s not that we are bored with battle. We just prefer a fight that’s gift-wrapped in nobility. Ken Burns’s fourteen-hour, seven-part documentary The War, a pie-eyed tribute to the heroes of World War II, captivated 18.7 million viewers on the first night it was aired in the fall of 2007, when the 2-16 was not yet halfway through its tour. In The Good Soldiers, the Rangers mournfully refer to their colonel, Ralph Kauzlarich, as “the Lost Kauz,” a nickname that links him implicitly with a worthless war and a lame-duck president. But as the book’s first sentence makes clear, the soldiers weren’t calling him that on April 6, 2007, when Finkel first joined the 2-16. If this wasn’t the good war, they would still be the good soldiers who could stanch the bleeding of a mismanaged, trillion-dollar campaign and rescue Iraq from a dystopian nightmare. But despite the moral imperative of the surge, Finkel immediately twists the concept of wartime “good” into a cosmic joke. He weaves several set pieces around “it’s all good,” the mantra Kauzlarich repeats to himself to keep his thoughts about the war orderly and trim, at least in those supposedly halcyon days of April 2007. Kauzlarich says it waking up in the morning, inhaling the bitter Baghdad air. He says it while driving in his Humvee as he passes through neighborhoods where more and more improvised explosive devices are shredding the limbs, skin and torsos of American soldiers, and he says it when he learns that the 2-16’s deployment has been extended from twelve months to fifteen. “It could seem like a nervous tic,” Finkel writes, “or a prayer of some sort. Or maybe it was a declaration of optimism, simply that, nothing more, because he was optimistic, even though he was in the midst of a war that to the American public, and the American media, and even to some in the American military, seemed all over.” It’s all good, gung-ho, nowhere to go but up–all good, that is, until his first soldier dies, US fatality 3,267 in a war of choice. Here, six versions of what nerve can mean filed out of the chapel. Mays went back to his Ambien. Hamel went back to his furniture. Bailey went back to his loops around the FOB. Wheeler went back to his what-ifs. March went back to his slide show. And Kauzlarich, red-eyed too now, went back to his office. 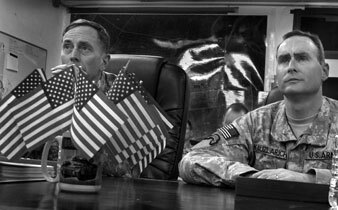 When our men in Washington and Baghdad finally meet face to face, in a particularly compelling chapter chronicling Petraeus’s visit to the battalion, Finkel exploits a cinematically precise juxtaposition of scale. Kauzlarich, a master of detail, prepares to brief the four-star general, who was by late 2007 an unlikely international celebrity, by ensuring the makeshift conference room is stocked with cookies, muffins, fresh fruit, coffee and Petraeus’s standby, Diet Coke. When the megawatt general walks onto the scene, he expresses his gratitude for the spread by reaching for a single grape, and then gets down to business. in the United States, where three dead on Predators might be mentioned briefly somewhere inside the daily paper under a heading such as FALLEN HEROES or IN OTHER NEWS, and the firefight in Fedaliyah wouldn’t be mentioned at all, it was about things more strategic, more political, more policy-driven, more useful in broad ways. Three dead? Yes, damn, how sad, and God bless the troops, and God bless the families, too, and this is exactly why we need to get out of Iraq, to honor the sacrifice, and this is precisely why we need to stay in Iraq, to honor the sacrifice, but you know what? Have you seen the numbers? Have you seen the metrics? Have you seen the trend lines? Finkel rarely attempts to develop his soldiers as three-dimensional characters, but he uses scrupulous descriptions to establish the intimacy of danger. When a piece of shrapnel comes flying through a door, “it sliced through the metal frame of his bed, sliced through a 280-page book called Learning to Eat Soup With a Knife, sliced through a 272-page book called Buddhism Is Not What You Think, sliced through a 128-page book called On Guerrilla Warfare, sliced through a 360-page book called Tactics of the Crescent Moon, sliced through a 176-page Calvin and Hobbes collection, sliced through the rear of a metal cabinet holding those books, and finally was stopped by a concrete wall.” Because this soldier was sleeping on his side, the shrapnel missed him by an inch. And so a new day begins. There’s a reason these warriors cite Groundhog Day more often than Black Hawk Down. The Good Soldiers has little to say about the plight of ordinary Iraqi civilians, most of whom remain inscrutable to the platoon, though at one point an exasperated Kauzlarich calls them “the most ungrateful fucks I’ve ever met in my life.” But Finkel does dedicate a poignant chapter to the story of “Izzy,” the platoon’s fearless and indispensable Iraqi interpreter, paid between $1,050 and $1,200 a month to face all the risks of combat and then some, without even the mitigating benefits of military camaraderie. As an Iraqi, he can never truly become “one of them.” And to fellow Iraqis, he’s a traitor. There is another, less flattering defi-nition of a “good soldier,” one that seems caught somewhere in Finkel’s blind spot. Obedience to authority is a time-tested military credo, and those soldiers who rise to higher rank are the ones who respect the chain of command. Ralph Kauzlarich, the book’s flawed but unequivocal hero, was also, at least at one point, this very type of good soldier. In Afghanistan, in April 2004, Ranger Pat Tillman was accidentally killed by soldiers in his own platoon. (The Army initially asserted that Tillman was killed in an Afghan militia ambush.) The incident immediately drew media attention because eight months after September 11, Tillman had abandoned a promising professional football career (and a $3.6 million contract) and enlisted in the Army alongside his brother Kevin. The same Kauzlarich of the 2-16 was the Army officer who directed the first official inquiry into Tillman’s death. While he wrote a recommendation for Tillman’s posthumous Silver Star–which helped spur a misleading, Jessica Lynch-style promotion of Tillman’s death for political purposes–he did not push to find out the identity of the shooter. “I don’t think it really matters,” he told ESPN Magazine. Kauzlarich likely had good intentions, seeking to spare his troops any further emotional turmoil. But in his zeal to protect the military, Kauzlarich wound up disparaging the family of a fallen soldier. In a brazenly tone-deaf statement, he said that the reluctance of Tillman’s parents to accept the results of the military’s investigation was the unfortunate result of their lack of Christian faith. (Kauzlarich is an evangelical Christian. Tillman was not religious.) As Kauzlarich told ESPN: “When you die, I mean, there is supposedly a better life, right? Well, if you are an atheist and you don’t believe in anything, if you die, what is there to go to? Nothing. You are worm dirt. So for their son to die for nothing, and now he is no more–that is pretty hard to get your head around…. So I don’t know how an atheist thinks. I can only imagine that that would be pretty tough.” An outraged Representative Henry Waxman called the comments “crass” and “completely inappropriate,” and officially requested that the Pentagon discipline Kauzlarich. To make things even worse, for himself and the armed forces, Kauzlarich acknowledged that Tillman’s Silver Star recommendation was an irregular decision. “I mean, had the story come out that he had been killed by his own guys, then it probably would have been looked at differently,” he said. The Pat Tillman saga is one of the most striking cautionary tales of the post-9/11 era, for the way it seems to reduce modern war to a hero industry–no different from Hollywood but with far more immediate and harmful ramifications. In this story, Kauzlarich was not one of the good guys. His role is mentioned in Jon Krakauer’s comprehensive new book about Tillman, Where Men Win Glory, but Finkel elides Kauzlarich’s minor infamy. In The Good Soldiers, Kauz’s ESPN comments are folded into a paragraph about his general candor and honesty, and never mentioned again. For a book that seeks to dispense with euphemisms and bring the sacred soldiers back down to earth, the lack of interest in Tillman is baffling. (If ever there was an illustration of the gulf between battlefield objectives and Washington PR, this is it.) After all, with Kauzlarich at the helm, the 2-16 is not just some arbitrary battalion. Given Finkel’s literary mindset, how could he not suspect that Kauzlarich–more “the lost Kauz” than the book lets on–might see the surge as an attempt to both win the war and rehabilitate his own image? The story of his involvement in the Tillman saga would have only further underscored the book’s distinctive seeing-everything-at-once narrative dynamic. It’s an untapped dramatic vein in an otherwise unflinching chronicle. One wonders if Finkel, bowing to military decorum by ignoring these extra layers, opted to play the good soldier himself. As such, The Good Soldiers inadvertently acquires a cumbersome cloak of irony. It’s a book about the illusory (or at least quotidian) nature of heroism that can’t help but succumb to hero worship. From an embedded reporter thrown onto the battlefield with a pen and notebook, this worship is common; the men with guns are his only protection against a hellish environment. One could even infer a sort of wish fulfillment, because when your life is in danger you want to be surrounded by heroes. And this may be the Washington Post reporter’s most profound takeaway from his trip across the great divide: that no amount of skepticism, critical distance or genuine awe can insulate you from the emotional bonds formed in combat. All faults and disagreements can fall away in a moment’s euphoria, in that secret place where “war is hell” gives way to “it’s all good.” I imagine we’d have to be there to understand.